Exercise Dusty Dalmatian saw 12 students from Cambridge University Air Squadron, one member of staff and one external instructor travel to the Istria region of Croatia to conduct 6 days of single pitch outdoor climbing, followed by one day of indoor lead climbing at Big Rock, Milton Keynes. The group was accommodation in a 9 bedroom house in the small village of Jezenj. Hire cars were used to transit from the airport and to the climbing locations each day. 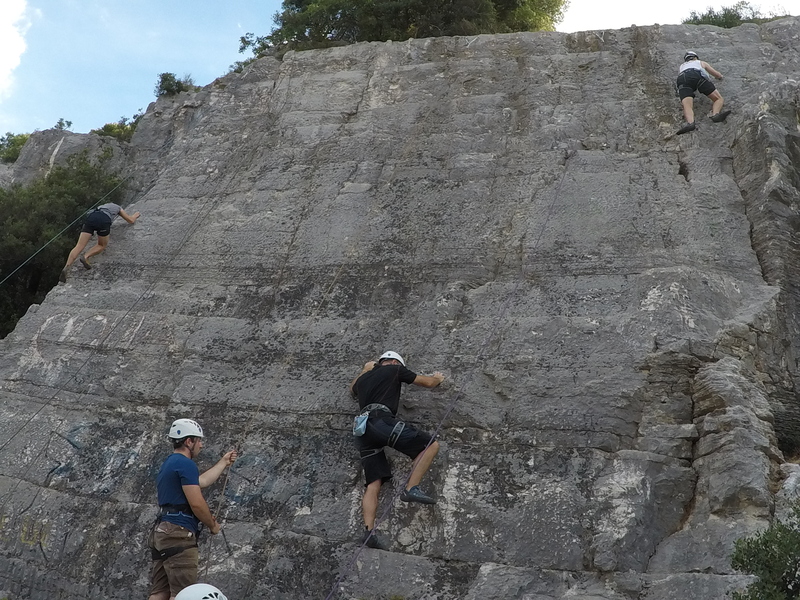 The primary aim was to deliver the Rock Climbing Single Pitch Foundation Qualification whilst developing the students’ teamwork, outdoor and leadership skills. By exposing students to unfamiliar surroundings and activities, they were stretched both mentally and physically. The nature of the exercise forced students to work interdependently and encouraged initiative. Affectionately known as Dusty, our trip began with a 1000 start from RAF Wittering. Our flight was delayed, and after what seemed like an eternity at the airport we finally set off. After a short time in the air, we landed in Pula, Croatia to find that our pre-hired cars were nowhere to be seen. In a stroke of luck, an alternative company as found who agreed to hire us the necessary vehicles for the week. There was a quick mental adjustment to driving on the right hand side of the road and before long we were greeted at our accommodation by the owners at around 2am who then showed us around the house. Due to our late arrival, we were granted a small lie in the next morning. By 1000 one group proceeded to the shops buy food for the week whilst another group sorted through all the climbing kit. On the return of the first group a warmly welcomed breakfast was made, followed by the day’s presentations in a cunning ploy to avoid the intense heat at midday. The day’s student presentation was on Guidebooks, Rock Types and Grading Systems, given by Jonny and Luke. The instructors delivered presentations on the Joint Services Adventure Training Schemes and Weather where we discussed the aims of AT, the idea of a growth mindset and the relevance of weather to AT both in the UK and in Croatia. 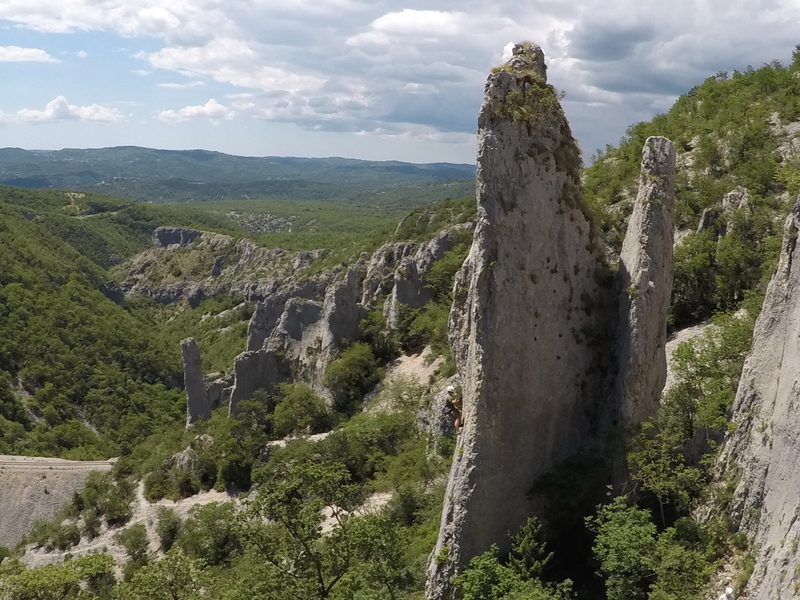 At 1330, we departed to the local crag in Pazin. Much to our surprise, it was the scene of an outdoor rave, but we carried on with the lessons regardless. After splitting into two groups our instructors taught us the basics of tying in and belaying before trying some of the routes. It was a steep learning curve for most. 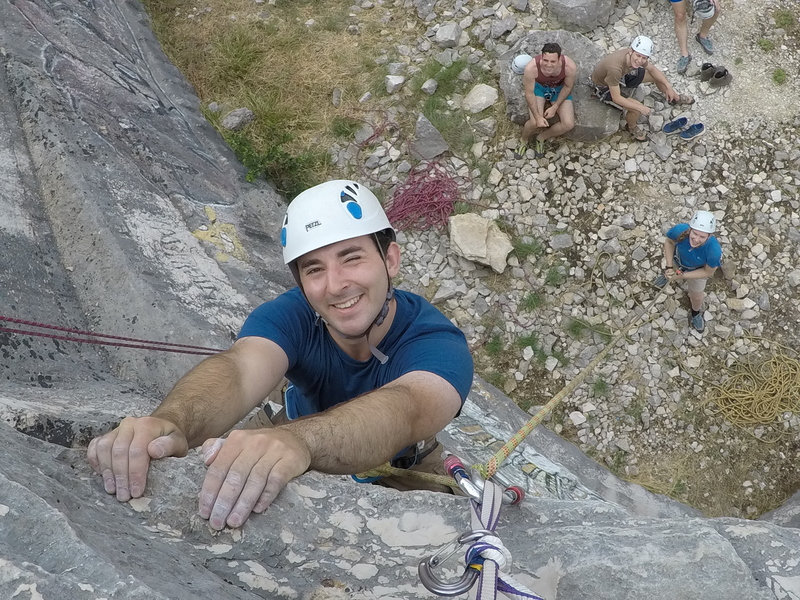 Like the vast majority of Croatian climbing venues, this was a sport crag, meaning the instructors had to lead climb the routes to set up the ropes. All routes had been given grades according to the French grading system. Ranging from f3 (theoretically easy) to f9b+ (near impossible). We worked in the range f3 to f6a throughout the week. It was at this early stage in the week we caught our first glimpse of the reality of Croatian grading. It wasn’t a soft touch. By 1730 everyone had tried all the routes so we headed back for dinner. After some great food, we briefed and sorted kit ready for the next day. A moderately early start on this day allowed us to climb in the coolest part of the day. After a minor navigational mishap, we eventually found the roadside crag. The routes were set up and we consolidated what we had learnt the previous day, be it with five ropes instead of six. It wasn’t until the latter part of the day we discovered our missing rope had disguised itself as a rucksack. We had lessons in setting up anchors and the different types of protection. Then, whilst on top rope climbs we had a go at putting in and removing gear on the way up. The routes were gradually becoming more challenging and towards the end of the day we set up a route that only Sid and Christiana completed. The limestone was very flaky with only a few good foot holes resulting in an early discussion of the lay back technique. Ollie the instructor set up one route and half way up discovered a large bees nest. This put off the likes of Ben but Jonny and Mary were still eager to go up and check out the bees. The drive back was less eventful than the drive up and we promptly returned to the accommodation to cook fajitas. The evening presentation was given by Barley and Alex on Types and Styles of Climbing, and the entertainment that evening was a quiz organised by Kevin (Paul). It was nice to refresh our GCSE science/general knowledge. The instructors also delivered a presentation on Summer Mountain Weather. As it the evening progressed we realised were in one of the worst possible situations. We were out of toilet paper. I’ll decide to not fill you in with any more details after that. 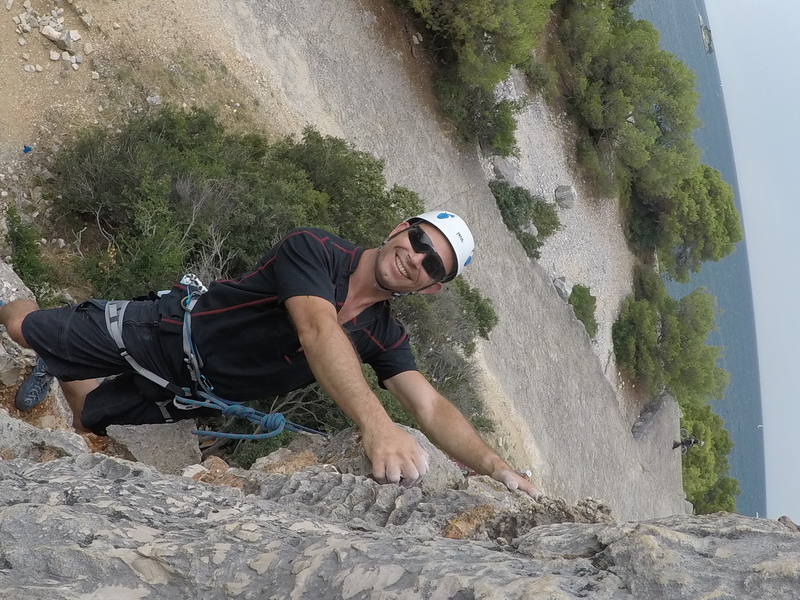 An efficient start to the day meant we promptly arrived at the beachside crag and set up 6 routes in the shade. Ben was pleased as these were distinctly more slab like than the previous climbs. Unfortunately, these climbs were not in the shade for long, forcing us to move round and adjust some of the routes to once again move back into the shade as it was too hot in the sun. The routes set up provided a lot of variation in rock type and difficulty meaning they were very different to those from the day before. Whilst these routes were being set up, Ollie set up an abseil overlooking the sea. He used a mixture of gear and a tree for safety and we all proceeded to have a go. Barley did a fantastic job of overcoming her fear of heights to go down the abseil not once but twice. We had lunch and then began to look at doing some lead climbing whilst still on a top rope of course. The rocks became so hot that fingers were sweating almost instantly making grip very difficult. After a short time attempting this we admitted defeat and made the decision to leave. Packing up became easier as we had named the ropes whilst waiting around: Brian the brown, Greg the green, and Clive the purple. When all packed up, we headed home to cook the roast chicken. Upon arriving, the heavens opened as forecasted and the thunderstorm arrived. Luckily the evening entertainment Kevin organised was indoors. It consisted of making harnesses out of newspaper and tape, with a competitive twist. These harnesses were tested on aesthetics and ability to hang gear off the loops which had been made. Paul and Mary delivered a presentation on Climbing Equipment and Clothing. A lightning strike took out half the electricity of the house including lights and fridges meaning everything had to be shifted to another fridge before everyone could go to bed. Day 4 started as it was to go on. Within minutes of setting off in the morning Ellie was so focused on adjusting the “murrs” (mirrors) of the car she was driving she managed to lose sight of the car she was following so took a wrong turn. After 10 minutes, a few phone calls, and passage through a tiny village the convoy was reunited. We again split up at a T junction but soon found each other again and finally reached our destination. The day began with some easier climbs to help everyone warm up and get into the swing of things. We reattempted the lead climbing practice on some easier routes so everyone could focus on the leading element (still on top ropes of course). Ollie sat on top of one of these lead routes and as everyone went up one at a time he showed them how to safely tie in at the top. We did this in threes as there was person to belay the top rope and one for the lead rope. This was accompanied by practice clipping in so everyone felt more competent. As the day progressed some far more difficult routes were set up to challenge everyone. Whilst Barley was up one route she shouted to tell us she could see a lot of cows approaching. The panic set in and everyone rushed to clear the path for what we expected to be a herd of angry bulls charging. It was instead four cows and a tractor slowly coming past. After they cleared climbing resumed. It was fantastic to see incredible perseverance from many of the individuals like Ellie on the middle route, Paul on the right-hand route, and Mary completing the far-left route after many attempts to overcome the crux towards the top. Sid also successfully reached the top of all three of the routes. After a long and tough day of climbing we headed to a great hilltop cafe with a great view. In the meantime, the dinner crew were making the bases and toppings for the pizzas and soon realised Ellie had bought corn maize as opposed to normal flour. The bases turned out interesting to say the least. Everyone put toppings on their pizzas and after dinner we had another presentation comparing climbing in the UK to Croatia given by Ben and Mary. Ben also delivered a presentation on the History of Climbing. Knowing we may have little cover from the sun we opted for an early start with the morning brief at 0630. The journey was surprisingly uneventful and we found the car park with only one wrong turn along the way thanks to Alex’s excellent navigational skills. The approach to this crag was about 15 minutes long over rocks and steep paths. Once we reached the crag there were some incredible views. Everyone was feeling it from the tough climbs the day before so this day began with some easier routes to warm everyone up. After everyone had a go on these, Ollie and Christiana set up some more routes across the crag. The first of which was an incredibly fun looking crack that was about 23m tall making it longest route of the week. Jonny was the first to go up and became stuck at the middle point for about 10 minutes trying to work out how to get up. After quite the struggle he eventually fought his way to the top. Sid was next followed by Ollie Addison and a few of the others also managed to get to the top. On the other side of the crag there was a shaded route which required a little thought and the not so often practised technique of bridging. There was also an arête which proved to be very difficult with limited foot and hand holds. Some got up it by physically bear hugging the edge with all their force and smearing up. The last route of the day was a sparsely pocketed f6a. The lack of good holds didn’t stop Sid who managed to reach the top regardless after a long and tough climb. By the end of the day everyone was exhausted and cuts and bruises were were now common place. We set off back to the villa and discovered a small dog had joined us. It was decided his name would be Pablo. Everyone loved Pablo as he provided endless entertainment. The evening consisted of another BBQ and a presentation given by Sid and Carolina on Climbing Access and Conservation in the UK. The instructors delivered a lesson on the importance of keeping a logbook. Opting for another early start, we briefed at 0630. As we left the villa Ellie almost killed Pablo as she reversed out and the rest of us beeped our horns and shouted out the window. Luckily Pablo moved just in time as he felt the wheel next to him. Rovinj is a particularly large crag and we’d barely touched the surface of what was on offer on day 3 and so headed back. We arrived at what we thought were some straightforward warm up routes, graded f3, and then couldn’t work out why Ellie was struggling so much. It transpired the climb was instead a f5c, but not admitting defeat, a number of different tactics were employed. The most successful of which was a jump to make the last move. The routes off to the left were slightly easier and gave a good variation in climbs. As the sun came in we moved around the corner. A lesson was once again learnt on the importance of looking after your equipment. One of the ropes was left behind at the accommodation and so we were down to five ropes and couldn’t set up a sixth. The culprit made up for it by belaying for a large part of the morning. Over again in the shade we had two ropes on the left and three over on the right. These gave a good mixture of routes and difficulties. There was another tough f6a, known as Mc Gyver, on which the group had varying success. 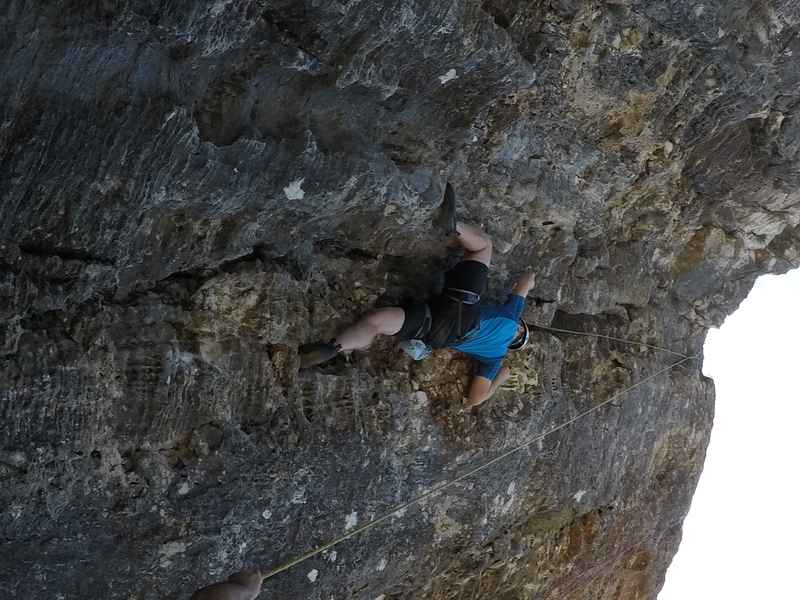 We also started challenges on some routes such as Ollie Addison restricting himself to one hand on a particular climb. We stayed there for quite some time allowing everyone to have a go on every route. By this point everyone was clearly quite tired. We set up another abseil down, this time a stacked abseil, and used that to get all the kit and people down by the sea path which took us back to the car park. After driving back, we did some packing, freshened up and headed out to the same hilltop cafe for a final night dinner out. The menu consisted of burgers or calamari, each with chips. The evening was a great way to mark the end of the trip. We packed the cars up and headed back towards Pula for our last day in Croatia. We started the day at an old military fort which was also an aquarium. Throughout the day, we had student presentations on topics such as: Austro-Hungarian monarchy, Roman history of Istria, and the maritime importance of Pula. This allowed us to learn about Pula as we went around. One group had lunch in an outdoor restaurant whilst another group went for a walk to see one of the churches. We reconvened at the amphitheatre which is frequently used for outdoor performances so was equipped with speakers and lights. After a short spell of rain it was drawing to the time we had to hand the cars back in. After dropping the cars off, we waited at the airport for several hours, our flight was again delayed for some time. After more waiting, we boarded the plance and landed in Gatwick by about midnight. After collecting the luggage we called our driver to find that he was still in bed, with his days mixed up. You can imagine the look on everyone’s faces when they found out. From here we needed a new action plan. One group oversaw sorting out a taxi, realising that finding one willing to do a 3 hour journey at 1am for 14 people was going to be quite the mission. The other group in the meantime had the crucial task of going to McDonalds. The team consisted of Luke, Jonny and Ollie who all thought it would be about a 15 minute round trip. After a walk, a train, a run they eventually arrived at the McDonalds at the other terminal. The order came to a staggering £40 and sent the staff in McDonalds into panic. After quite some time they managed to get all the food. They carried this crazy amount back trying not to spill any of the drinks on the way. They got back about an hour after they set off. Still no taxi in sight. After more waiting at airports (a recurring theme of the trip) a willing taxi picked us up and we arrived back at Wittering by 0530. After the eventful journey the previous day we didn’t set off to Milton Keynes until 1330 to ensure drivers were within their hours. After getting to Big Rock we split into two groups as we were now down to one instructor. 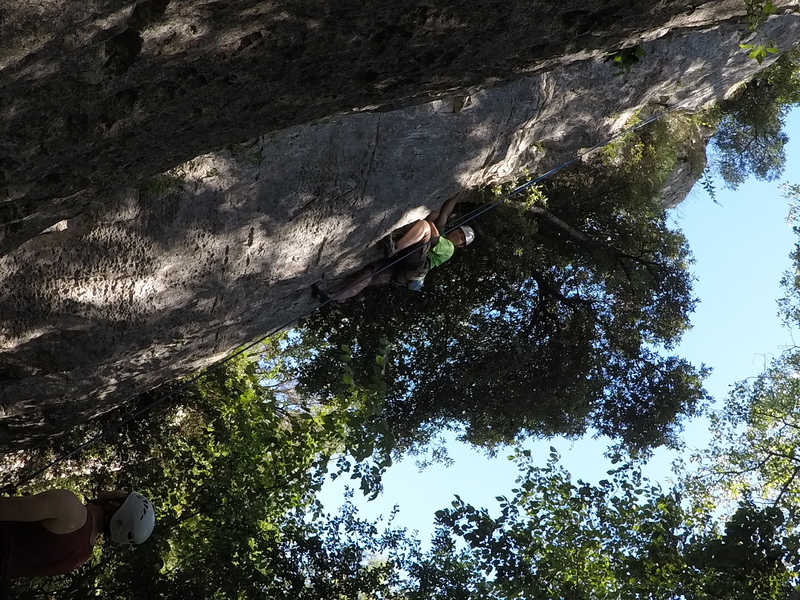 Today was all about learning and practising lead climbing. One group climbed at a time, this included practice falls in this safe environment which were a useful tool for confidence building. After one group was competent we swapped around and the other group had a go. Unfortunately, our time at the indoor centre was limited because we all had to get back to Wittering in time for dinner. After dinner, we sorted all the kit and conducted a group debrief where we found out everybody had passed the course. Safe to say everyone had a fantastic week and can’t wait for another trip next year! The challenges briefly mentioned in the diary of events are detailed below. The temperature was hotter than expected. The expected average max. temp. was 26 degrees however the max. temp. ranged from 30 to 34 degrees. It was mostly dry during climbing hours. There was increased vigilance from all members to ensure everyone used sun cream, the group hydrated regularly and took appropriate measures against the heat. The timetable was adapted on 13/14 Jul with an early start to avoid long sun exposure at locations with less shelter. This was particularly useful when climbing at Vela Draga. Vela Draga was an ideal climbing location in a National Park, however it would not have been possible to climb there during the mid/later parts of the day. The climbing felt considerably harder than the grades given in the guidebook. For example, as instructors we felt in the majority of cases 5c was nearer 6a+/6b. When this was confirmed not to be limited to one location, this further limited the options in the region. However, enough crags were found to be both suitable in grade and direction. With enough shelter from the sun and each providing a balance of confidence-building and more stretching climbs for different members. Car hire company, Nova Car Hire, breached their agreement to monitor the flight and deliver the cars when we landed. A delay in the flight resulted in the company leaving the airport without informing us. An alternative company, Sixt, had their office open and agreed to hire us three cars for the week. The delay in acquiring hire vehicles caused us to be later than expected to check in at the accommodation. The owners however were understanding and agreed to wait for us to arrive. Our transport did not pick up expedition members from Gatwick airport on the morning of the 16 Jul due to an internal communication error within the transport section. A taxi company was used to return to RAF Wittering. This caused an additional 2.5 hour delay in returning to RAF Wittering and additional cost of £360. The delay in returning to RAF Wittering severely reduced the time spent climbing on 16 Jul in order to comply with driver hour regulations. Only 1.5 hours was spent climbing at Milton Keynes. This, combined with the group being split into two groups due to only having one instructor on 16 Jul meant the leading lesson was very rushed. However, having practised leading with the safety of a top rope during the week, all students were successful in learning to lead. What did I learn from Dusty? This expedition was challenging for many reasons. Such factors included high temperatures, tiredness and climbing that pushed every member to their limits. This meant that it was essential for every person to work together as part of a bigger team, rather than as an individual to support and encourage each other, both while climbing and while completing daily household chores. Everyone benefited from the experience of others, be that the inexperienced learning from the more experienced, or the experienced learning how to pass on their knowledge through effective teaching. It is fair to say that by the end of the expedition, everyone truly knew that what became the trip motto, “When you think you are ready to give up, you still have 60% to give”, was a true statement. Everyone learnt how to persevere and overcome mental barriers to their physical abilities, reaching heights that previously seemed impossible. What I learnt during Ex Dusty Dalmatian. As one of the more experienced climbers on the expedition I was given many opportunities to teach and pass on my skills. After completing each climb it was common practice to explain the route to the next climber and give them any tips you might have. These opportunities to pass on knowledge and experience allowed us to all lead others to develop their technique and increase the whole group’s capability. I have a huge personal fear of falling and have always disliked rock climbing but through the UAS have been trying to conquer this fear. 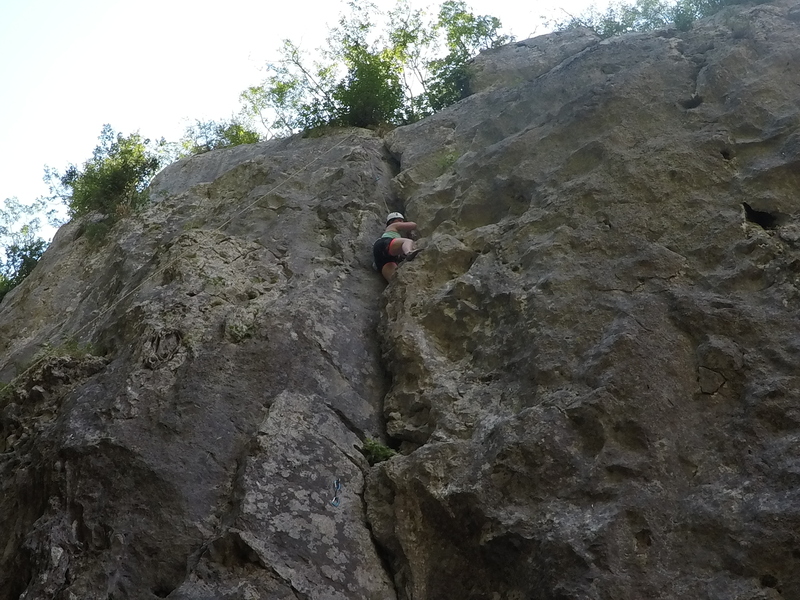 Ex Dusty Dalmatian was my second week of climbing AT and I was definitely able to see a personal improvement in my climbing but as the week progressed we also took part in several abseils which petrified me. For the first abseil I was on a safety line similar to one I had done the year before but I still didn’t want to go though. After my first descent, I decided to do it again to prove to myself that I could get over my fear. Later that week we did a different abseil without a safety line and despite my progress earlier in the week I was shaking as I approached the cliff edge, but with the support and encouragement of my team I managed to slowly make my way down the rock face. During the week, the locations where we climbed contained routes of varying difficulty to cater for the range of experience in our group. Having never climbed before, this gave me an opportunity to try some routes which were very challenging, given my lack of experience. There were several occasions throughout the week where I was halfway up a route, feeling physically exhausted but, with helpful encouragement from others, I still persisted and completed the climb. The satisfaction of reaching the top in these instances was immense and far greater than on climbs which I was able to navigate without difficulty. Overall during the week, I managed to complete all but one of the climbs that I attempted and I believe it was this determination which led to a rapid improvement in my climbing skill over such a short time period. Since this was my first time climbing, I began the week with little knowledge of specific techniques and manoeuvres and so throughout the Ex I therefore made an effort to try and learn as much as I could. This often involved repeating climbs or sections of a route which I had previously completed using brute strength alone, but this time trying to master specific moves such as bridging and the heel hook, which would later help when tackling harder climbs. 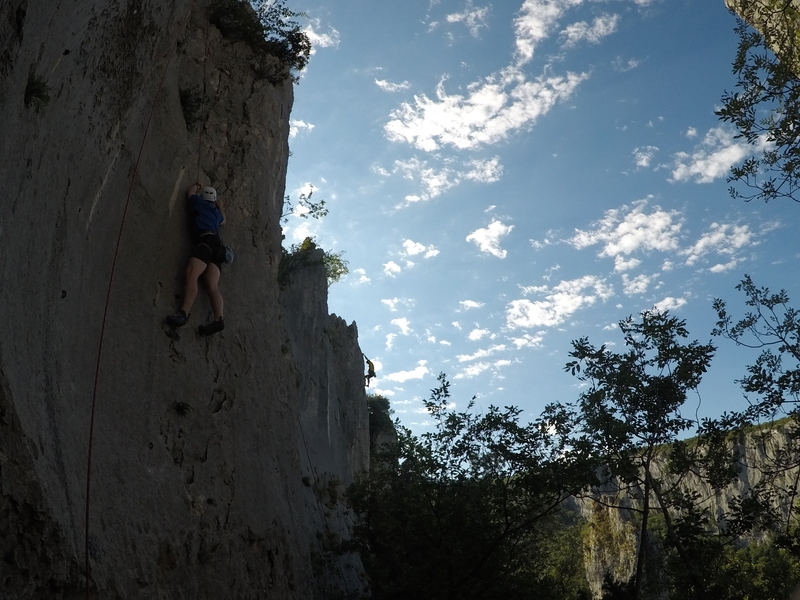 By practising my technique on the less challenging climbs until it the moves came easily and were more natural, I was able to progress to harder climbs as my improved technique gave me more options when attempting the route. Ex Dusty Dalmatian was a success with all aims achieved and the foundation JSAT climbing qualification achieved by all members who all developed their climbing technique and confidence. The nature of the Ex required all members to work interdependently, testing their ability to work as a team. By the end of the week, everyone, some of whom were complete novices, was able to lead climb indoors. 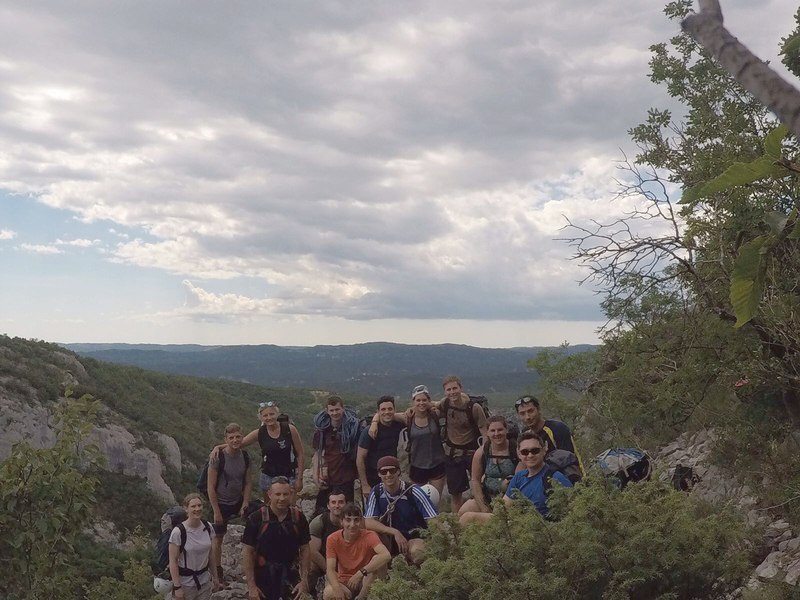 We physically and mentally challenged all group members, not least the instructors who after pushing the students were in turn challenged to set up routes beyond their comfort zone and gained just as much from the experience. It was the first foundation course that both instructors had delivered and thoroughly enjoyable and useful experience. Stepping away from the climbing, a group of young adults were tasked with living as a group, cooking, cleaning and looking after their equipment. Their personal skills were developed as well as their ability to look after each other. Cooking for 14 is no small task as some found out. 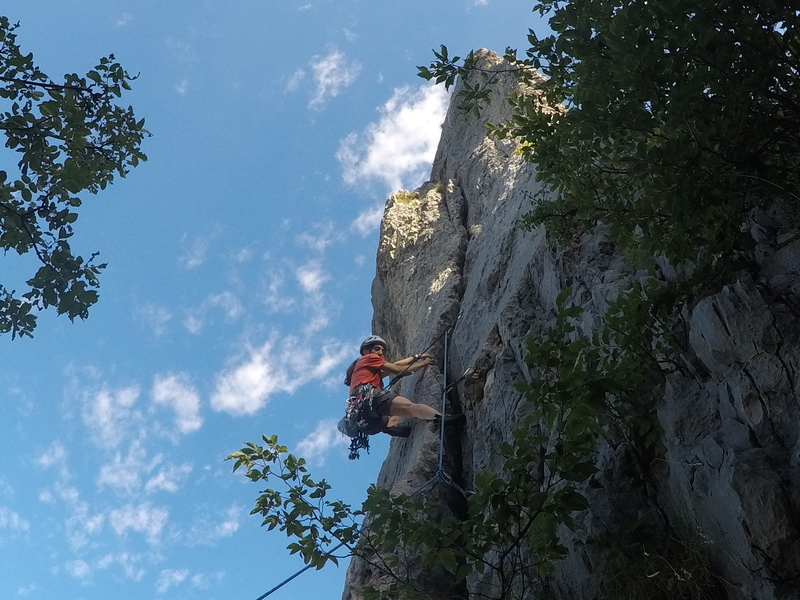 As described above, the students learnt a great deal about perseverance, with some overcoming fears and others climbing harder routes than they thought possible with the encouragement of their peers and a can-do attitude. The idea of a growth mindset was a recurring theme throughout the week with the group encouraged to be open to failure and learn from it rather than never trying. I firmly believe participants left with a more positive attitude to trying something that at first might seem out of reach, an attribute broadly applicable to everyday life.